Max. Height above ground: 183ft. Special track elements: Banked Curves, Vertical Loop, Steep Twist, In-Line Twist, Half Loop, Corkscrew, Banked Helix, On-Ride Photo, Large Loop and Half Loop. 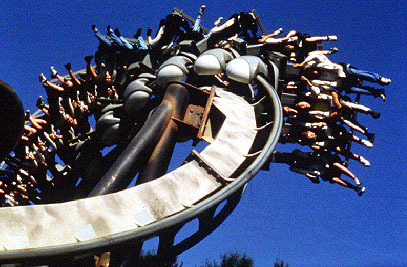 Other info: An Inverted Roller Coaster feels more intense and exciting than a sit-down roller coaster; due to the exposed feeling the riders have with their feet dangling below them and the lack of a car around them. Maximum Ride Capacity: 120 guests, Vehicle Capacity: 4 passengers per car. Maximum Ride Capacity: 56 guests, Vehicle Capacity: 2 passengers per car.